As mentioned before, the containerization of the worlds trade made the regular cargo ships quickly obsolete. Holland America now had to review what it was going to do. Containerships were expensive to built and each ship would also need on average three slots of containers (a slot is one full set of containers that a ship can carry) to make such a ship operational. Quite a few containerships would be needed to maintain the traditional routes and the services that HAL had always offered. By 1970 it became very clear that the company had to make a choice; it did not have sufficient funds to invest in expensive cruise ships and in expensive container ships. Focus had to be put on one or the other. After a lot of to-ing and fro-ing it was decided to concentrate on the passenger business and eventually the cargo part was sold to a Swedish company called Bostrom. They kept the old HAL fleet for a long time under the Dutch flag under the name of Incotrans. They added even two new containers ships to this company, ships that were especially designed for the Europe – West Coast of America service. I did my apprenticeship with that company in 1979/1980 and transferred to Holland America after I obtained my nautical degree. Being a cadet on a brand new containership might have been less fun but it had several -study- advantages over sailing on an old cruise ship. 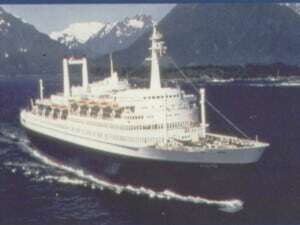 The existing passenger fleet from the North Atlantic days was transformed into a cruise – only fleet, with a new logo and a new blue hull color. 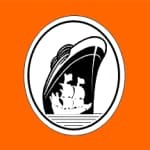 The “wave logo” on the flag and on the funnel had been dreamt up by a design team and the idea was to “visualize” that HAL was going to make waves in the cruise industry. The first ship to fly the new flag was the Bilderdyk (II) which was docked in Rotterdam as she was about to enter service. The funnel color was supposed to be dark orange/red but in reality it was never the same as the paint mixture produced on board by the bo’sun varied each time the funnel was repainted. The Statendam IV was the first passenger ship that was repainted in the new cruise colours. Dark blue hull with an orange funnel on which the new “Wave” logo that the company had adopted. 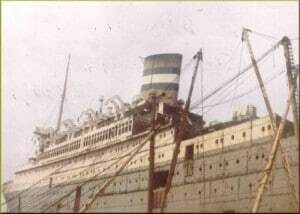 Older tonnage was sold for scrap, including the Nieuw Amsterdam of 1936. As this ship was considered by many the most beautiful passenger ship ever built, after the Normandie of the French Line, the ship retained its original colors until her last sailing. She was never given the blue “cruising” hull but the company let her keep her gray colors as a reminder of her Trans Atlantic Glory days. 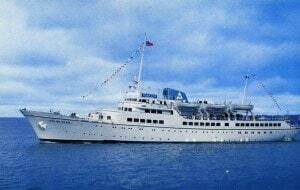 Plans to convert her in Rotterdam to a hotel and museum, fell through due to oil crises and she was scrapped in 1973. With the proceeds available from the sale of the cargo side, Holland America started an expansion program. 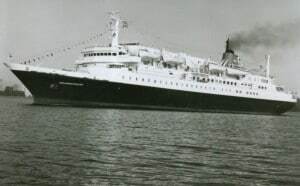 The first addition to the cruising fleet was the Prinsendam of 1973. A small cruise ship of 8,566 tons with a length of 430 feet; she could carry 374 guests in lower beds giving it a space ratio of 22.9. Sailing in Indonesian waters in the winter and Alaska in the summer. The company decided for a small ship due to the uncertain times and the gamble that cruising only was still considered to be. Nobody knew how big the market was going to be for the cruise business. Thus a small ship was built to test the waters. Due to the oil crises, the option for a sistership was not taken up. 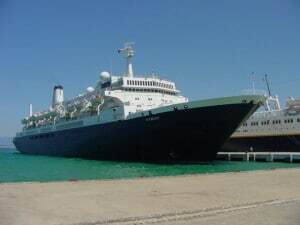 The Prinsendam I only sailed for the company for seven years. In the in autumn of 1980 she caught fire in Alaskan waters and later on sank. All 300, very mature, passengers were safely taken off by means of the ships lifeboats. The evacuation was so successful that one complaint that the company received said it all: why was there no orange juice served in Holland America lifeboats but only water ? The Prinsendam I spent her summers in Alaska and her winters in the Far East. She helped making Holland America the dominant cruise company in Alaska. The next step was the acquisition of two American passenger ships; the Brasil and Argentina from Moore McCormack Lines. After this american company had ceased operating passengerships to South America these ships had become available for sale. An issue that had to be solved first was to obtain the approval from the US Congress to allow them to be sold to a non-american operator. Approval was needed as both ships had been constructed with the aid of government grants. When this approval finally came, the oil crises was hitting the world and the company had quite a challenge on its hands have them operate in such away that they also made money. 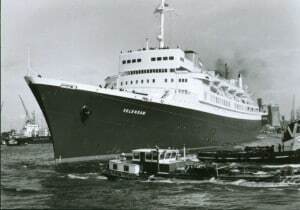 After a refit in Germany, they re-emerged as the Veendam and Volendam in 1973. The Volendam II departing from Rotterdam. It looks that the barge skipper was not at all perturbed by the soaring bow of the ship and just skidded through under it. The sisters each had a volume of 23,372 Grt and carried 736 guests and 340 crew. This gave them a space ratio of 31.8 These were very well built ships and could have been used as troop ships had time demanded so; The lower decks were a real warren of small compartments and sections separated by watertight doors, extra safety built in due to the troopship capability. As the cargo holds had not been converted, the ships had an enourmous storage capacity for their cruises. The ships were for years a fixture on the New York – Bermuda run, making seven day trips. The Veendam left on sunday and the Volendam on saturday. They remained in service until 1983 when they were sold for further trading. The arrival of the N-ships had made them obsolete to the company’s requirements. As a testimonial to their strong construction, both ships were only scrapped in 2004 after sailing for another 20 years with other operators. 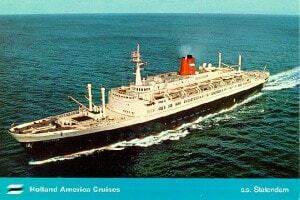 After 1973 it was quiet for a long time and for various reasons no other ships were added to the fleet. Not counting the Prinsendam, the company had four steamships in operation but by 1980 three of them were coming to the end of their economical life and were not longer up to the job. The Statendam suffered from major boiler problems and the V-ships were rather heavy on the fuel consumption and there was a lot of under utilized space on board due to their layout and cargo holds. Thus the thought went to building two new ships, motor ships, that would incorporate all the best and latest in cruising and would be very economical in operation. The result was the N – class. 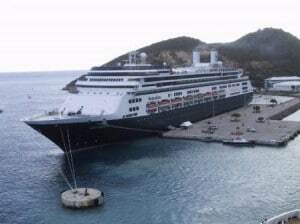 The Noordam of 1984, here seen in Kusidasi Turkey in 2002. Holland America had for years been trying to develop new cruise markets and open up new destinations. It had been well aware since the 1960’s that the North Atlantic liner service was slowly fading away and something new was needed. By the 1970’s Alaska was up and coming and HAL was closely monitoring the increase in popularity of “The Great Land” with the mainly American tourists. A Seattle company called Westours (named after the owner Chuck West) had been operating tours to and in Alaska since 1949. By the 1970’s Westours had become so successful that it decided to buy two medium sized cruise ships. For use in Alaskan waters in the summer and Pacific cruises during the winter. The Polar Star of Westours. Although well suited for the Alaska service she was too big for Westours to handle. She was renamed in Pacific Star after Westours wanted to employ her in the warm pacific and thought the name Polar would not go well with warm weather cruises. However, there was a problem marketing the Westar and Polarstar in the winter and the company ran into financial problems. Holland America stepped in and had in one move the Alaskan tourist industry more or less completely under control. It could offer a complete package with its own ships, its own cruise and overland tours and its own Hotels. Westours was partly acquired in 1970, fully merged in 1983 and absorbed in 1996 and then loosing its own identity. Through the years Alaska became more and more populair and Holland America moved more and more ships into the area. Although other companies such as Celebrity,NCL and Princess have followed, HAL is still the main player in the state. We have 7 or 8 ships there every summer, operate a total of 240 buses, are running 14 sky dome trains, have our own sightseeing boats on the Yukon and on Parmatigan lake and manage 8 hotels. 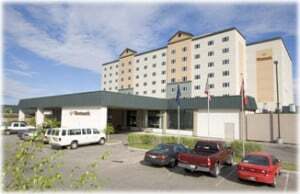 Shown here is the Fairbanks hotel with 401 rooms and 86 suites. The 1980’s were the years of consolidation in the cruise industry. Strong companies knew they had to grow in order to survive and one of the ways of doing this was by absorbing other operators. Thus Holland America bought Windstar in 1987. This French -American company had built three motor sailing yachts. 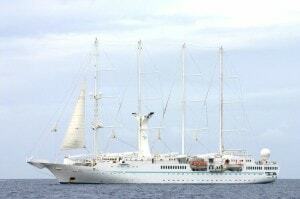 Ships with 4 masts and 6 sails and each yacht carried 148 guests in laid back luxury. The Windspirit one of the three motor sailing yachts of Windstar. These were not sailing ships but motor ships with the idea to sail as much as possible, while the engine enabled them to keep their cruise schedule. The company had been founded in Dec. 1984 by Mr. Costa Andren (Owner of the New York Circle Line) with four ships planned. The fourth ship was never built as they ran quite quickly into cash flow problems. One of the reasons was that these ships were marketed by French management while their clientele were mainly Anglo Saxon. So in 1987 HAL bought 50% of the company and the remainder 50% in 1988. A few years later the Club Med 1 was taken over from Club Med and renamed in Windsurf. While of this was going on; the company renewed their company logo once again. With the arrival of the N-ships it had resurrected the NA logo of the past showing the soaring bow of the NA II, towering over the Haelve Maen of Henry Hudson. On 1 July 1986 the new logo came officially in use. Henry Hudson was the Englishman, who in Dutch service discovered the Hudson River and Manhattan and later on the Hudson Bay. An aerial view of the Homeric as built. After three years in service she would return to her builder to be stretched by 100 feet. Although a nice vessel from the beginning, many guests who sailed on her, pre and post stretch found her looking better after the lengthening. A further step in this cruise industry consolidation was buying Home Lines in 1988. This company specialized in cruises from New York; cruises with a distinct Italian flavor but it was not doing that well. Thus HAL bought the company with its two ships; the Atlantic and the Homeric. The Atlantic did not fit in the companies profile and was later sold off. The Homeric became the Westerdam III. It was added to the fleet in 1988 with a tonnage of 42,092 Grt and a base capacity of 1132 guests, giving a space ratio of 37.2. When this ship was first designed it was laid out to be considerably bigger. However as Home Lines wanted to operate the ship to Bermuda, it had to fit in Hamilton harbour; and the longer version never became part of the final design. Holland America; feeling the pressure from Carnival in the Caribbean market, thought this was an excellent opportunity to add a big capacity ship to their fleet by stretching the Westerdam by 100 feet. Thus in the winter of 1989/1990 the ship returned to it’s German builders, was cut in half in a covered dry dock, pushed apart and 11 new sections were added in the middle. The lengthened Westerdam in the covered building dock of the Jos Meyer Werft in Papenburg, Germany. When she was built, the large shed was not there yet and the ship was certainly one of the last passenger ships to be launched from a conventional slipway. I was one of the supervisors during that period in Germany and it was very eerie to see the front of the ship moving, while aft the ship remained where it was. This was accomplsihed by placing the bow on little train carriages and moving it hydraulically forward. When the stretch was complete, it was most impressive, to walk on the bridge, switch everything on and to observe that EVERTHING worked. Every cable that had been cut had been properly re-connected. The German labor skills were very impressive. When she came back in service she had a volume of 53,872 brt. and carried 1476 guests (max. 1773 guests) with a space ratio of 36.5. 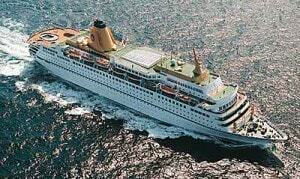 The ship was sold in 2000 to our sister company Costa and she sails nowadays as the Costa Europa. In the late 80’s Holland America obtained a life time lease of Little San Salvador Island from the Bahamian Government and renamed it Half Moon Cay. The island has 9.5 miles of Beaches of which HAL uses approx. 2 miles on the sheltered NW side. Here was also an harbour constructed; for the ships tenders to bring the guests ashore and a little village was built for the guests to use. The island is very popular with the guests and Holland America is adding more and more facilities to it every year. On 10 January 1989. Carnival bought the Holland America Line. The question immediatelly comes up why? By the mid 1980’s Carnival had more or less cornered the seven-day mass market and it turned its eye to the Premium 5 Star market. The market segment of the industry where the Holland America ships operated in. Carnival started Project Tiffany to see how they had to go about it to accomplish that. 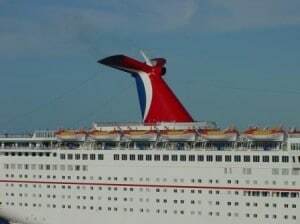 It found two things, one it is not that easy to develop a product that is totally different than what you are used to and secondly the people cruising in the Premium market did not like Carnival at all. At the same time, Holland America was having problems with attracting new clients. First time cruisers, normally select their cruise on cost and only sometimes on recommendation. There was no way that HAL with a $ 1200 a week ticket price could compete with a $ 300 a week for Carnival. Thus both sides had a good reason to come together and Holland America Cruises was taken over. It worked out fine; HAL became an independent brand within the Carnival Corporation and extra funds became available for expansion. An order for two big ships that Holland America had been planning to have built in Germany at the Bremer Vulkan yard was not finalized; instead it was decided to built the medium sized S-Class. They had some typical HAL design features. The crow’s nest made popular on the N-ships was incorporated. A two level dining room was located at the stern with windows on three sides, so the guests could enjoy the scenery (especially in Alaska) while having dinner. Inside that diningroom the orchestra booth from the Nieuw Amsterdam II days reappeared. 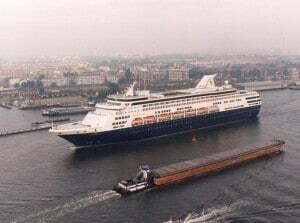 The Statendam IV arriving in Amsterdam in 1993. After more than 20 years the company returned to making North European cruises. New was having the lifeboats halfway up the hull instead near the top decks. New safety rules had come in. The cruise ships were getting bigger and higher and the lifeboats were going too high up for safe lowering. Thus the lifeboat embarkation deck came dome to about mid level. The now-freed up space was given over to Balcony’s, which offered a small private deck space for each cabin not to be shared with anybody else. The ships received a major upgrade in 2006 (under the Signature of Excellence program). Further upgrades are planned in 2009-2010 and that will mean that the ships can continue to offer the company product for a long long time to come. The new flagship of the company the ms Rotterdam VI seen here docked in St thomas. Due to the tremendous success of the S-class and the desire of Holland America to deliver longer cruises, the R-class was developed. The first one,;the Rotterdam VI came as a replacement of the Rotterdam V, who retired in 1997. It was a most amazing feat, and a credit to her designers, that this ship had lasted so long after the end of the Trans Atlantic days. By the late 80’s the cruise ship building boom started but the Grand Old Dame managed to attract a very loyal following until the very end. The ss Rotterdam V, still going strong in Alaska territory. Her career would last from 3 Sept. 1959 until 30 September 1997, so nearly 38 years. It is expected that Hotel ss Rotterdam will open her doors in the city of Rotterdam in the summer of 2009. Being Steam, her fuel bills where almost triple to that of an N=class ship and double to that of a S-class ship. Also the new safety regulations coming in force on 1 October 1997 would require a considerable reconstruction of her interior. Holland America found that it could not justify all those costs and so on 30 September she left the fleet. Sailed for a number of years as the Rembrandt; was then laid up for some time but has now returned to the city of Rotterdam. With the Millenium celebrations on the door step, the company decided once more to change the company house flag. 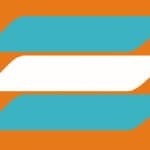 The NA/Half Moon logo remained but the orange background disappeared and was replaced with Blue, White, Blue horizontal stripes. Almost the same as the first company flag, just with blue instead of green. During the commissioning of the Amsterdam (II) in 2000 the new flag was shown to the outside world for the first time. In 2002 the company went one step further with the construction of the Vista Class. Although HAL was not going the way of Carnival or RCI with building mega liners, bigger ships were needed and mainly for two reasons. One we still had to compete with Carnival, Princess, Celebrity and RCI to keep attracting new clients. The battle for the first time cruiser is fought on price and only secondly on reputation. That meant that HAL needed better-priced ships in the 7 and 10 day market. Secondly the Alaskan and Caribbean ports were getting fuller and that meant that the big ships got preference for docking and the “little ones” were banned to the anchorage. 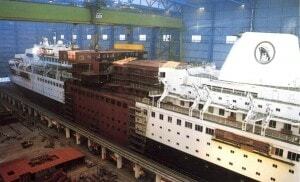 So the company developed in corporation with Carnival a Class of cruise ship that measured around 80.000 tons. This size had been considered big in 1989 when HAL was taken over but was by 2000 just considered medium. This project 8000 design has also been used by Carnival for its own ships and by P&O and Cunard with some variations. One of the pure Vista class hulls is sailing for P&O as the Arcadia. The Vista class ships are named after the main compass points. Zuid(erdam) being South, Oost(erdam) being East, West(erdam), being West and Noord being North in the Dutch language. With the distinction that Noordam is also a town in the Netherlands near Rotterdam. The leadship of the Vista Class, the Zuiderdam. Designed to be panamax, the maximum size hull that fits in the Panama Canal locks, so the ship and her sisters can be part of the annual migration of cruise ships to Alaska. In the end Holland America commissioned four ships of this class with the Zuiderdam measuring 81,811 tons and carrying 1848 in lower beds. Giving a space ratio of 44.3 Specs. for propulsion. These are a sort of outboard motors hanging under the stern and can be turned 360o while in operation. This eliminates the need for normal propellors, stern thrusters and rudders. The last ship of the Vista Class, the Noordam, was delivered in 2006 and while this happened the company was already working on the next class of ships. In the same way as the R class was a development based on the S class; the new Signature Class was a further evolution of the Vista Class. When new ships enter service; there are always ideas coming up to improve upon the design. You can add a cabin here, or change a lounge there and use the available space in a more optimum way. Also our Hal repeat guests, the mariners, are never slow in asking for new things and or pointing out what could be better or in general letting their observations know quite loudly. Holland America is a company that listens to all this input where economically possible. Thus when more ships were planned, it was decided that these ships would be based on the Vista Class hull but would have soo many different features that a different class name was appropriate. This resulted in the concept of the Signature class. Two ships were ordered and the first ship the Eurodam was baptised on 1 July 2008 by Her Majesty Queen Beatrix of the Netherlands. The next ship is scheduled for 2010 and will be named Nieuw Amsterdam (IV) and so a great name will live on in the company history. For further details I refer to the company’s website. Final Note: I am aware that with this outline in four parts I am still barely scratching the surface of the 136 years of company history. I hope to add some more material during my coming leave periods. Also some items will be moved over to the specific ship section, where more individual ship histories will appear. Thank you for your continued interest. Captain Albert. I have enjoyed your blog and am looking forward to it’s resumption. I also very much enjoyed your History of the company. A friend, Jim Button, sailed on Rotterdam VI on the first “Around the World” cruise as security officer. His wife, Martha, was able to travel with him. She had been in the Peace Corps with me in Costa Rica in the early 1960’s. I was able to visit them on the ship in Los Angeles and during the cruise they sent e-mails (few in those days), postcards, letters and pictures to my 7th grade students. We had a big map on the wall of the classroom tracking them and the ship. After the end of the cruise they surprised the students by spending a day at school. Jim wore his uniform and they brought all sorts of things they’d collected along the way. I still see former students who ask about “Aunt Martha and Uncle Jim” and Rotterdam. Captain, great history of the Line. Have only sailed once (Ryndam, 2004; our only cruise ) but very much appreciate shipping history and the NASM/HAL’s is so rich. You have captured it well. Within the top 10 of my favourite content pieces, thankyou! Thank you for writting this informative blog. thank you for reading my blog. I have not yet added the history of the Groote Beer to my blog site yet, as I still have a few blanks in their voyages as she came to the company sideways as an emigrant carrier. I very much enjoyed reading your 4 part blog. My mother, my oldest aunt and uncle, and my grandparents traveled on the Ryndam in late 1953 to NY, my grampa bringing his Belgian Bride and new family back home to the States. In 1990, for our 25th wedding anniversary, we went on the M/S Noordam to the Virgin Islands. What happened to this cruise ship? Thanks. the ms Noordam was sold in 2004 to a British package holiday operator called Thomson Cruises. Then this was rebranded to Marella Cruises and she is still sailing for them in the Mediterannean. 3 star level but she still looks very much like a HAL ship inside. Outside she is now white and her name is Marella Celebration.